As noted in my Raw Review yesterday, the King of the Ring has returned in 2015. This special on the WWE Network starts with a recap of the First Round of the Tournament, which aired on Raw last night. 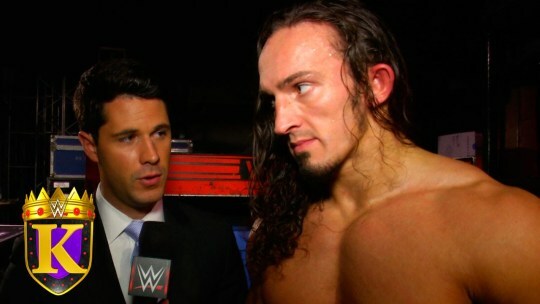 We then get interviews with both Neville and Sheamus, who are opening things. These two had a good match on Smackdown recently which ended via disqualification. I feel like their match on Smackdown was better than this outing. Granted, this wasn't bad but it was just there. Playing off of last night's Dolph Ziggler involvement, Sheamus was nearing a win only for Dolph to show up and distract him. This allowed Neville to take advantage and win with the Red Arrow. The win was good but having Dolph get involved kind of put a damper on it. Dolph and Sheamus then had a good brawl that ended with Sheamus' eye being busted open. Our next Semi-Final match pitted R-Truth against Bad News Barrett. I prefer the first match to this one but this was fine. They did solid work and Truth did cut a funny promo about spiders beforehand. He's really good as a comedy character. Barrett wins with the Bull Hammer and advances, giving us an all England finale. The Finals would turn out to be the best match of the night. Their match on the KickOff Show during Extreme Rules was good but I think this was slightly better. we got some cool near falls and Neville looked great. He came very close only to get overzealous and fall victim to the Bull Hammer. This gave us King Bad News Barrett. I was pulling for Neville but I like this route. The King angle works best for heels and I'd love to see a rubber match between the two at Payback. Maybe two out of three falls. Overall, this could have been done much better if it were planned a bit more in advance. It felt rushed but was still an enjoyable way to spend an hour. I'd love to this as an annual thing again and it's a step in the right direction. 7/10.